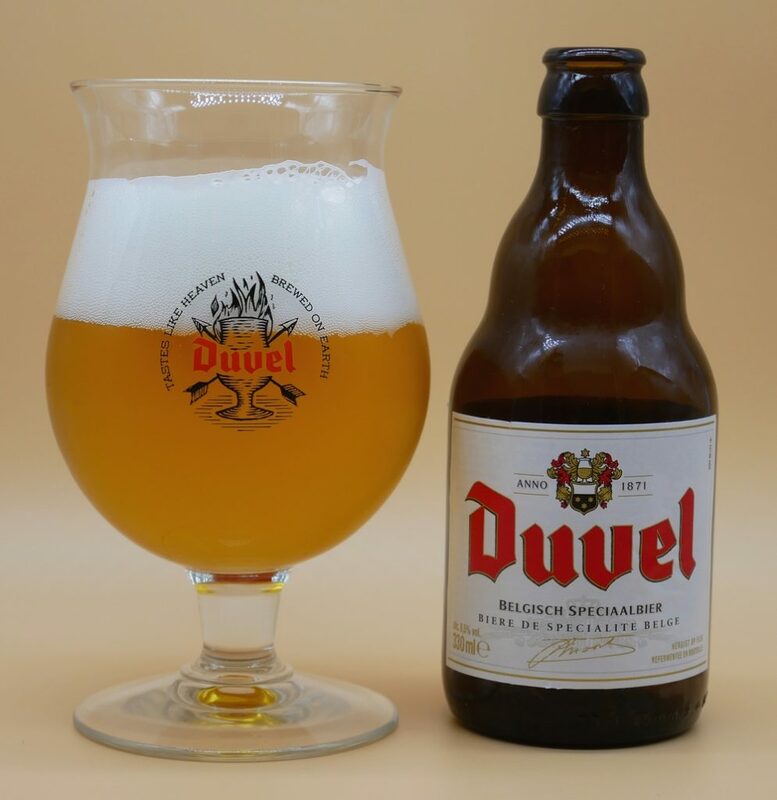 Something that sets aside Belgian beers like Duvel is a particular taste profile. Imagine the difference between a Czech Lager, an English Ale and a French Saison. All are essentially made from the same ingredients, water, malt and yeast, with varying amounts of hops depending on the style. The backbone of the flavour though is the yeast choice. Duvel, originally founded in 1871, has a long history of brewing excellent beer. It started though when they travelled to the UK with the intention of obtaining some English yeast with which to begin their brewing. For whatever reasons though they couldn’t get any, or were prevented from doing so and then travelled on to Scotland where they successfully procured some yeast with which to start. Yeast is a living thing, however, and it’s interesting that after a century or so Duvel’s Scottish origin yeast has taken on what we now see as a classic Belgian profile. Duvel makes quite strong beers, and 8.5% is not to be taken lightly. However balance is something that Duvel is thoroughly in control of and it doesn’t taste strong, just pleasingly flavourful. 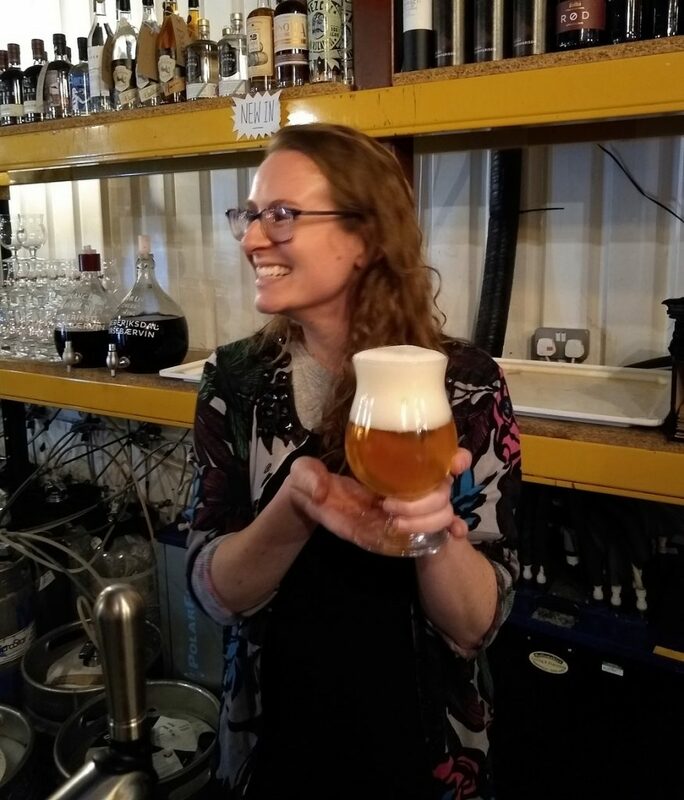 Duvel Belgian beer is also known for the creamy, meringue-like head on its beer, It’s so good that many other brewers would openly admit they would kill for such a head on their own creations! And therein lays the problem that up until now has prevented Duvel from being widely distributed on draught, being kept to bottles on the whole. Carbonation or fizz is something that is quite important to flavour, have you ever drunk flat Champagne? It’s just not good, yet white wine is much the same and not carbonated. If a drink is designed around carbonation then it should have it. Duvel’s carbonation is pretty high at 4 volumes. Most other beers would be 2.5-3 at maximum. Duvel has stuck to bottles ar many years now as they couldn’t reproduce the high level of carbonation properly, and the beer was just not the same. Until now! Some work and research and experiment recently has allowed Duvel on draught to finally happen. 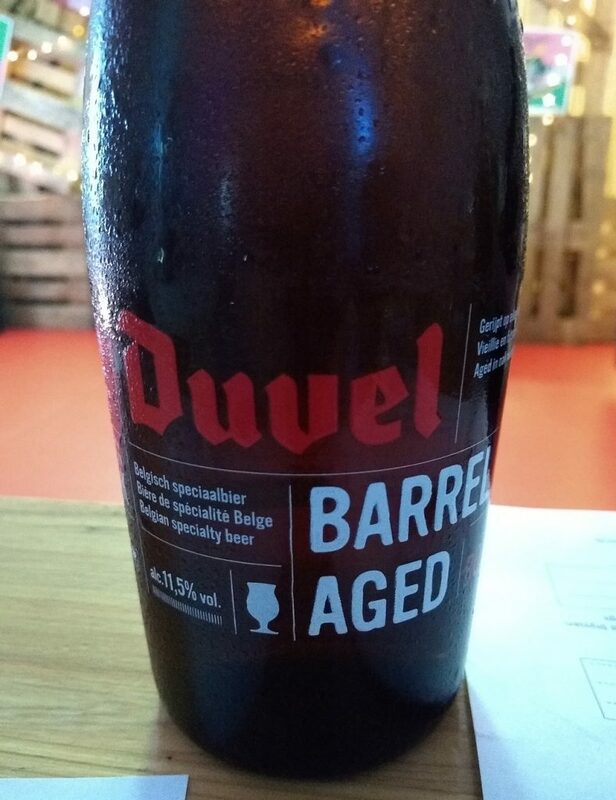 I was invited up to Duvel’s launch of Duvel on draught in the UK, which also coincided with the release of this year’s tranche of their barrel aged beer. 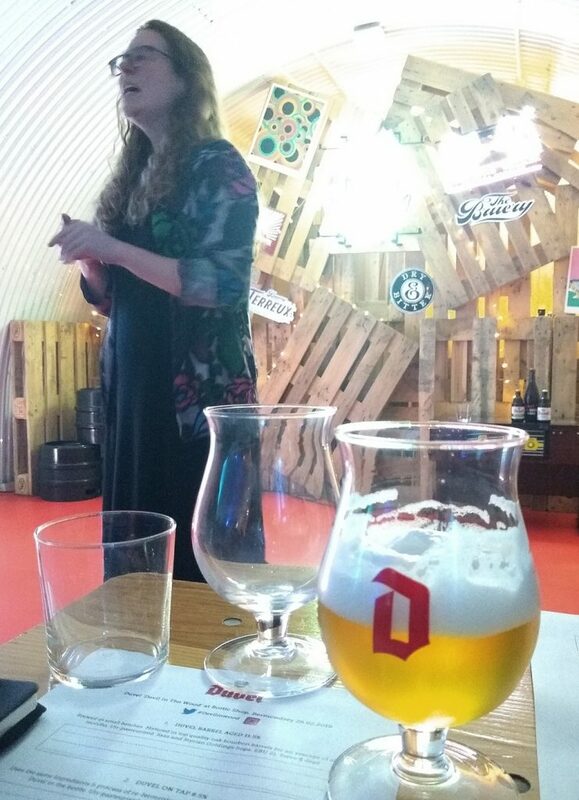 We were most ably talked through the history of Duvel Moortgat by brand ambassador Natalya Watson. A number of breweries are now partaking in the trend for barrel ageing of beer. Think of Whisky…. sitting in barrels for a period of time to pick up all the complexities of taste and aroma that a barrel can give. Beer can do the same thing, and just as well. Barrel aged beers are not cheap, as time and effort go into them above and beyond the normal. However, the pay off is complexity and deep, rich flavour, and an increase through evaporation of alcohol level. First off we tried the standard Duvel blonde. This is always a treat, clean, estery, bright, creamy head and gentle lingering bitterness from the European noble hops. Then we tried the Barrel Aged. Much lower in carbonation, it was wine-like in one sense, but unmistakably still a beer, aromas of vanilla were present, and a slight but distinct hint of Bourbon from the barrels used. I found a bit more malty character coming through also, with a slight hint of chocolate. Beers such as this also pair extremely well with food. Comments at my table were that it would be fantastic with roast lamb. After this, we moved on to try the Duvel on draught with a chance to pour our own. As promised the same Duvel-only head was reproduced with ease. Taste-wise myself and the other beer-nerds felt we could detect a very small difference between bottle and tap, but in all honesty given a blind tasting sample, where we didn’t know one from the other I strongly doubt we’d have been able to tell them apart. Were I to be in a pub and see Duvel on draught, it would be a no-brainer to choose it. To be honest, if I visit a pub or taproom, I still feel like I want to default to draught or cask. The cans and bottles in the fridges that you find in many establishments these days are great to see and provide a huge choice that wasn’t available a few years ago. But the sight of pumps and taps is a much stronger pull for me. Hence my happiness at seeing Duvel Belgian beer finally on tap. Where bottles win out perhaps is the speciality beers. Duvel’s barrel aged editions sit firmly in that category. I’d feel very happy to be able to have a glass or two of Duvel blonde, and then be able to share a bottle of barrel-aged with a couple of friends to finish the evening. Duvel is currently on draught at two venues in the UK, with plans, I believe, to expand out in time. The Barrel-aged bottles will be quite sought after and are likely to appear in the bottle shops rather than your local supermarket. Well worth searching out. As a genuinely British craft beer experience, I’ve recently visited Borough Market to learn about the Borough Market seasonal craft beer. Definitely worth trying!